Nice version of the peave flag, Pat. A lot of us are blogging for peace today. I hope a lot of people are also reading for peace. Considering all the unpleasant political commentary around the internet, peave flag is appropriate, but today, yes — let’s stick to thoughts of peace. 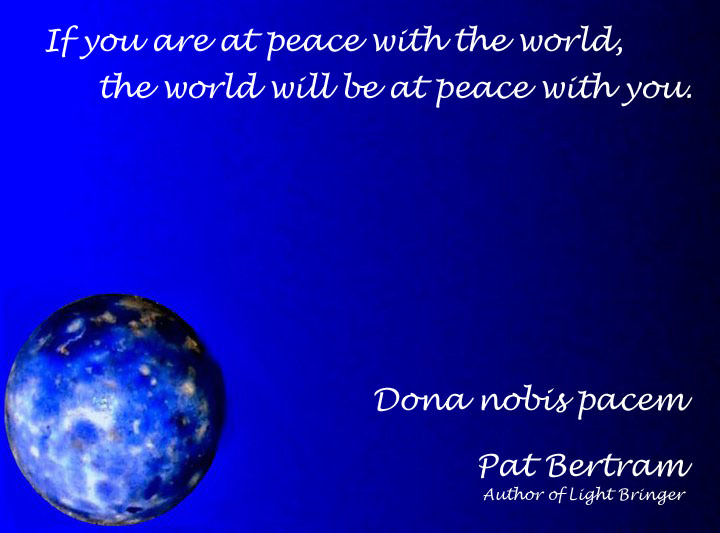 I like that…If you are at peace with the world, the world will be at peace with you. Lovely Peaceglobe. Peace to you and yours! Thank you! Have a peaceful day today and every day afterward. I want to thank you for bringing this day to my attention. I did a post on peace yesterday in response to your message. So glad to know that you posted about peace yesterday. I’ll stop by to check it out. So excited that you have joined our peace movement in November. Your blog is a delight and full of depth and meaning. Thank you. I enjoyed doing the peace globe, but most especially I like the idea that since words have meaning, blogging for peace was important. Thank you for starting such a project.